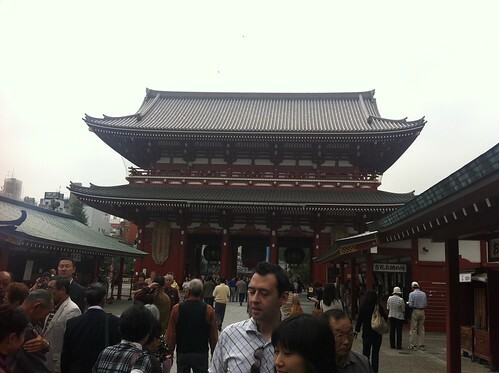 I spent the last week in Tokyo for YAPC: :Asia. It was great! I had the incredible privilege of being an invited speaker. I gave one of my favorite talks, "Email Hates the Living!" as a keynote. I was pretty nervous about how it would go over, but it went very well, and I had a lot of fun giving it. I'll try to recap everything else I did. I flew out of Newark on Tuesday morning around 11:30. To get there in time, I had to catch the 5:00 bus, which meant getting out of bed around 4:30. This wasn't so bad in and of itself, but... well, I didn't sleep well the night before flying, then I was up for about seven hours before my flight, which was about fourteen hours long, and during which I only dozed a little bit. When I got to Tokyo, I should've been completely fried, but actually I felt fine! I was a little dazed, maybe, but felt otherwise okay. I managed to find my way from Narita to Ueno to the Pauley's neighborhood with no trouble. Karen was kind enough to come find me at the station, because I realized that my plan for finding their place -- "look for the really tall building nearby" -- was not a very good one. Martin and Karen Pauley were my gracious hosts, and a major factor in the great time I had. They gave me plenty of good advice, good suggestions on sites to see, and kept me well fed. Oh, and of course also a comfortable place to sleep with a nice view of the (mostly overcast, sadly) city. They did too good of a job: if I find myself back in Japan, they'll probably have to figure out how to politely deny my excited request to stay with them again. At any rate, I got to bed around 21:00 and woke up around 6:00. This was the most normal sleep I'd have until my last day. Every other night, I'd be nodding off by 18:00, but stay up until 2:00, but wake up at 6:00. I seemed to get onto Japan time just in time to head home. Fortunately I didn't miss much because of it -- except that I was asleep on the subway when Gugod and I parted ways, which was a bummer. Thursday was my one totally free day, where I had no plans or places to be. Karen and Marty asked what I wanted to see, and I was a bit embarassed to say that I had absolutely no idea. They made some great suggestions, though. When I woke up (early), I got to work at finding where their suggested destinations were. Between Japan Guide and Wikipedia and a Tokyo Metro map, I found all the places they'd suggested, plus a few besides, and sorted out routes to them. Although the Tokyo Metro had seemed daunting at first, it ended up being extremely easy to navigate. Still a little cautious, though, I waited for Karen to get up, and she came along on my sightseeing. 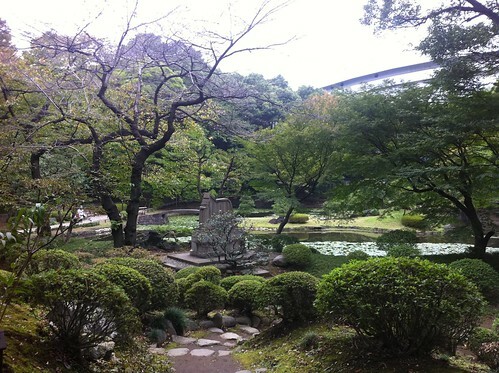 We went to Sensoji Temple and Koishikawa Korakuen, both of which were gorgeous. I felt pretty silly to have brought no better camera than my iPhone, but I had gotten it to upgrade to iOS 5. The new quick access to camera made a big difference. I'm not sure bringing my better camera, a dinky little PowerShot, would have resulted in better photos. I'm just not much of a photographer. We also went to Akihabara, described by one site as a "nerd Mecca." All my friends who'd been to Japan told me to go, too. Karen only came along to show me where it was and get lunch. She said the stores were too overwhelming for her, and I can see why. They're almost all either cramped with random stuff or blaring music and ads in all languages. We had okonomiyaki for lunch. It was definitely the strangest thing I ate while there. We also picked up some incredibly expensive donuts from The Donut Plant. By trip's end, I had decided that while Japan had lots of delicious baked goods, I would not get more donuts next time. Akihabara was a neat place, and reminded me of the MIT Flea Market at its peak. Unfortunately (or fortunately) for me, there weren't too many things that tempted me much. I kept seeing neat things, then reminding myself that I didn't really have much use for them. I had a short list of things I was hoping to find, and to my amazement only found one. I bought it (a peculiar USB adapter), and also picked up a very cool nylon-braid-encased cat-6 cable. 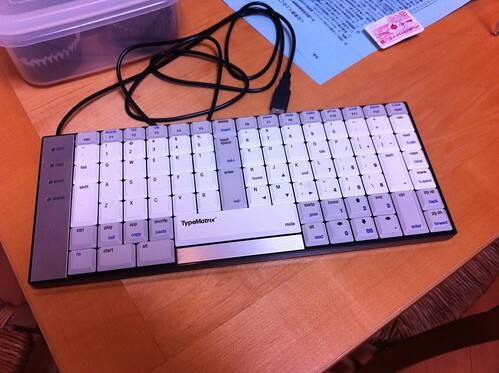 I spent a lot of time looking at neat keyboards, but in the end I decided that the only ones I liked anywhere near as much as my current (Apple chiclet-style) keyboards were not worth the cost. The coolest keyboard I saw while there was Marty's TypeMatrix, but it just seemed like it would be a bit too hard to learn, and without any serious hand pain to motivate me, I gave it a pass. Jesse arrived Thursday night, and we went out to CoCo Curry, a Japanese quick-service curry chain. I actually enjoyed it quite a bit, and next time I'm there, I'm going to try to get their spiciest curry. This time, I had to settle for a 5 (out of 7). It was still good! Jesse and I decided to skip RejectConf. That's the day before YAPC::Asia, where unaccepted talks are presented. It sounded like a cool idea, but the talks were all in Japanese. The next day, YAPC::Asia began in earnest, though, and we both had talks to give and attend. We started the day right... with breakfast at Denny's. Jesse said I could claim that he forced me to go there, so that's what I'm doing. Actually, it was fine. 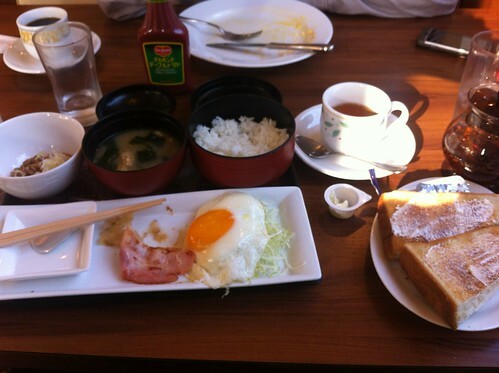 I ordered the traditional Japanese breakfast, and enjoyed it -- except for the natto. I knew all about natto before trying it, and kept my mind well open. After all, I'm a big fan of scrapple. All I'm going to say is that natto is definitely in the running for "worst food I ever put into my mouth." The conference's first day was great. Our talks went very well, I met a bunch of people that I'd only known online, and I got to see the Japanese lightning talks. These were really interesting, because as often as not the slides were in English while the presentation was in Japanese. Sometimes that meant I could understand them. Other times, not. Still, I could pick up on which speakers were well-known and whether the talks were technical, humorous, and so on. It was in the lightning talks that it first really sank in that Japan's Perl community is something of a peninsula. We, in the west, know that it exists and we see some of its members doing stuff, but there's a huge amount of activity and community that we just can't access because of the language barrier and (I'm guessing) time difference. The latter's importance was reinforced daily: I'd get up early and talk to Gloria and Martha just before their bedtime, then each night before bed I'd talk to them just after they got up. Even a night owl would have time zone problems working with someone in New York from Japan. Lunch was Chinese food, which was surprisingly similar to American Chinese food. 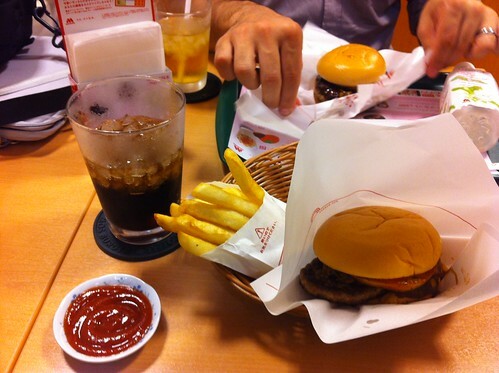 Jesse and I ended up on our own for dinner and hit Mos Burger, Japan's number one fast food joint. We both ordered the same thing, which we dubbed the Bitter Disappointment Burger. It was what you might make if someone showed you a photograph of a hamburger, with no further details, and said, "make that." We should've just done another curry. Day two of the conference was even better than the first. After brunching at an excellent Korean barbecue (at least compared to the ones I've been to before), we got to the conference venue just in time for my second talk. During my first talk, I'd failed to test my projector set up sufficiently. Everything looked fine until I saw that the bottom bullet and Japanese subtitles were usually cut off. Ugh! On Saturday, I made sure this didn't happen. The talk (Email Hates the Living!) went very well. I'd been warned to expect virtually zero audience reaction, but I got a number of good laughs and felt great about it. It rekindled my desire to write the sequel. I also attended Shawn's talk on DTrace, which kept me wanting to get better at using it. There was another round of lightning talks, which revealed an excellent fact: Kenichi "charsbar" Ishigaki has resurrected CPANTS, and is running nightly updates. I told him that I'd see about doing some of the improvements to metrics that we'd talked about the last time it seemed like it might come back from the dead. Already I've used it to make a dozen or so improved releases. 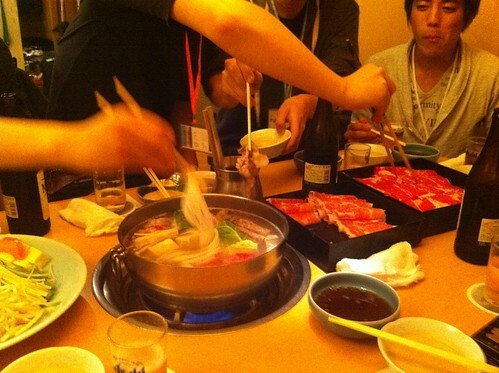 After the conference, we went to the post-conference dinner of shabu-shabu, which was delicious. I really enjoyed the whole experience of the meal. The food was good, the company was good, the atmosphere was good. 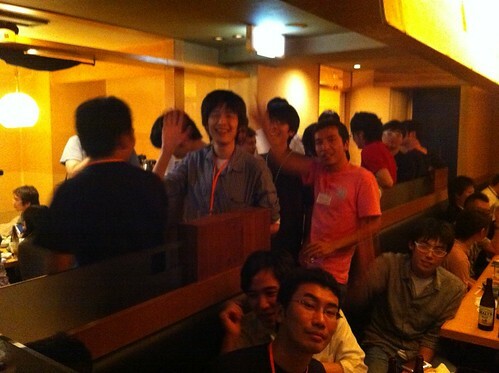 The Japanese Perl Mongers were an incredibly friendly bunch. There was unlimited beer! After the eating was largely done, and we were down to just socializing, someone called me aside to ask why I hadn't made Email::Sender use Any::Moose. The answer was sort of interesting, but I was having a hard time explaining it, because there was a significant language barrier. Finally, I fetched my laptop and wrote some sample programs showing the problem while a small crowed watched. As I got to the key part of the demonstration, there was a chorus of "oh!"s. It was really excellent to use Perl as a lingua franca, even if it was only useful for the limited topic of programming discussion. It made me think of all the stupid sci-fi where we can only talk to aliens using math. In those, though, we're not having a great time and drinking bottomless beer with our interlocutors! Jesse and I left before the festivities were over, but we were beat. Everyone waved enthusiastically when we left. It was totally unlike what we would've experienced in the states. I should probably also mention the low point of the day: I picked up a "green tea and milk" donut. It was inedible. What was I thinking? The next day was Sunday, my last full day in the country. We started out with a second trip to Akihabara where I continued my search for weird cables and Jesse ogled high-end cameras. We didn't buy anything. For lunch, we headed to Obana, an unagi restaurant of which I'd heard only great things. I am a huge unagi-lover, so I was really looking forward to this, and it was absolutely worth the wait -- both the wait for my trip to Japan and the hour wait in a line outside. The company of Karen, Marty, Shawn, Kim, and Jesse made the wait enjoyable and the meal even more enjoyable. 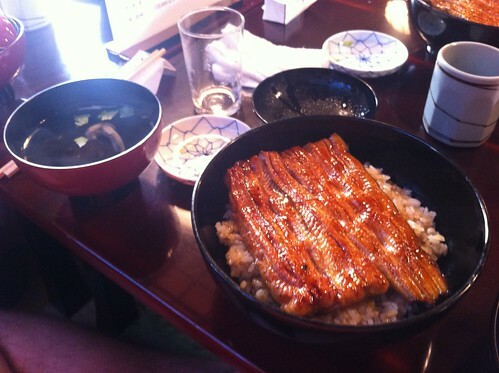 Although the eel was (of course) amazing, I was also really impressed with the rice. It was several orders of magnitude better than any rice I've had in the states. Shortly after lunch, Jesse and I were off to the post-conference hackathon. I'd wanted to work on Email::Sender, but it turned out to be a non-starter. The problems I'd uncovered in porting it to Any::Moose (which I'll detail in another blog post) were too complex, and I had nearly no brainpower left. Instead, I worked on making my advent calendar software use Color::Palette. This was pretty fun, and so far seems to have been a good idea. 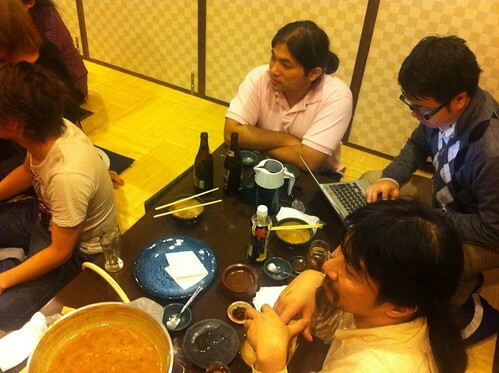 The post-hackathon dinner is traditionally (I am told) "nabe" or, as everyone kept telling me, "sumo food!" It was basically a hot pot into which we dumped all kinds of stuff. Unlike okonomiyaki, which seemed like a bunch of disjointed stuff unified mostly by sauce, the nabe's contents all seemed to work together on their own, and I probably could've eaten twice as much as I did -- but I'm glad I didn't. I had a great time talking with the guys there, and was sad to go. Then again, if I'd stuck around much longer, I would've been asleep at the table. We got back to Marty and Karen's and I stumbled into bed. The next morning I woke up at a pretty reasonable hour and Jesse and I headed back to Akihabara to visit the smaller shops. Although most of them were closed at first, we had a good time wandering around. I made a few small purchases and then headed back to finish packing and head to the airport. I thought I'd left with plenty of time, and would get to Narita with two hours until departure. I'd forgotten to make sure, though, that the train from Ueno to Narita ran as often as I'd assumed. I figured it was every 15 minutes, at the most, but it turned out that I had a 50 minute wait to the next train. I ended up arriving at the outskirts of the airport with only 70 minutes to departure, and bags must be checked an hour before. I sprinted like a crazy person and found Continental. When I told them what flight I was on, they opened another station to get me checked in and took care of it while I gasped wildly for breath. When I got through security, it was about 25 minutes to departure, but boarding had been delayed. I had no problems getting onto the flight, which was long and boring, but which also landed early. Customs and immigration were no problem, and soon I was reunited with Gloria and Martha. 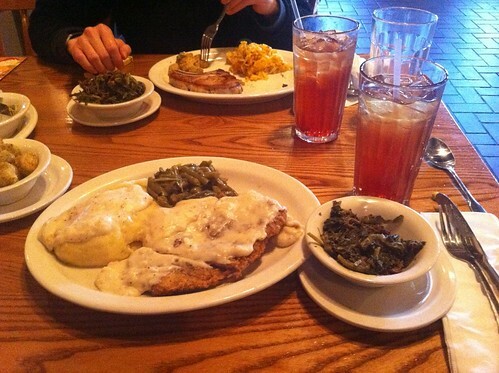 We'd promised Martha that we'd get a good all-American meal at Cracker Barrel on the way home, and we did. 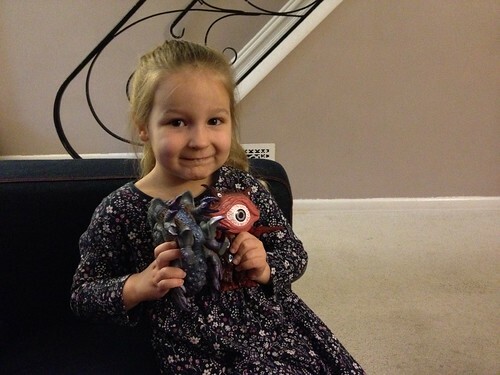 When we got home, I gave her the gifts I'd picked up for her: two Ultraman kaiju. She loved them, and named them Blood and Gray. More than any other place I've visited, I feel like I want to go right back to Tokyo and see a bunch of the things I couldn't see this time. Maybe I'll get back next year!